My dear friend and Reiki Master, Libby Barnett put together a lavish birthday basket for my husband Lee, full of all things healthy including our favorite protein bars, organic jelly beans, almonds, coconut water and pomegranates! 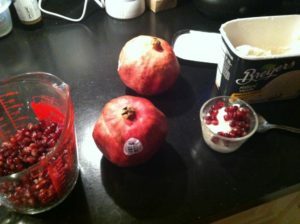 It ended up being a gift to us all and the pomegranates inspired our new favorite dessert – Pomegranate seeds over vanilla ice cream! 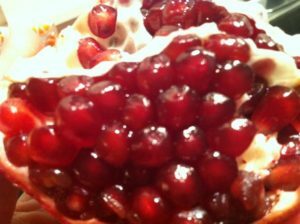 Simple and delicious and the vibrant red makes it a perfect dessert for Valentine’s Day! 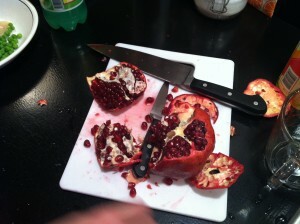 Andie and I disagreed about how to cut open the pomegranates. She was a fan of the method recommended on this site www.thekitchn.com while I chose the immersion in water method recommended on this site www.simplyrecipes.com. We’d love to know if you have a favorite way! 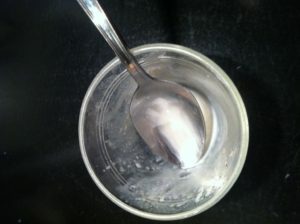 Perhaps the photographic evidence will help you decide which method you’d prefer! 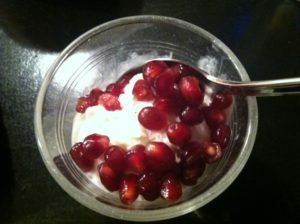 Despite our disagreement about approach, we both agree that the result is delicious! I hope you get a chance to try it! Any favorite Valentine’s Day recipes to share from your end? 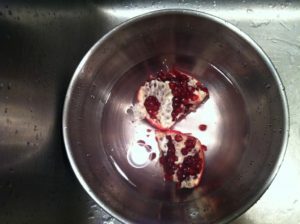 Tucker would be extremely grateful for something involving less fruit and more sugar and flour!